Game Designer: Larry Harris, Jr.
Summary: A classic WWII-themed boardgame for 2-5 players; starting in 1942 the game covers the whole globe on a game-map broken up into chunks like Risk; similar to Risk in some ways with with a satisfying increase in complexity without becoming overly detailed. 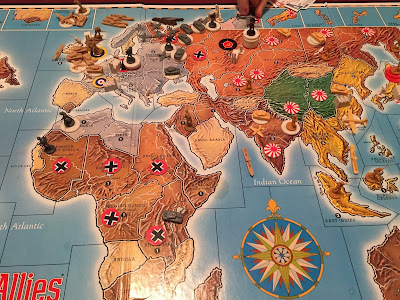 Albert and James both list Axis and Allies as one of their top three favourite board games, so we decided we'd best do a review of it as soon as possible. We recently finished playing a game doing a turn or two each evening for a week to give us extra inspiration. For anyone who enjoys boardgames and is interested in World War II history, this game is pretty much a "must have". The game is recommended for ages 12+ but James (7 years old) had no difficulty playing and in fact he and Albert playing the Axis defeated me last time we played. 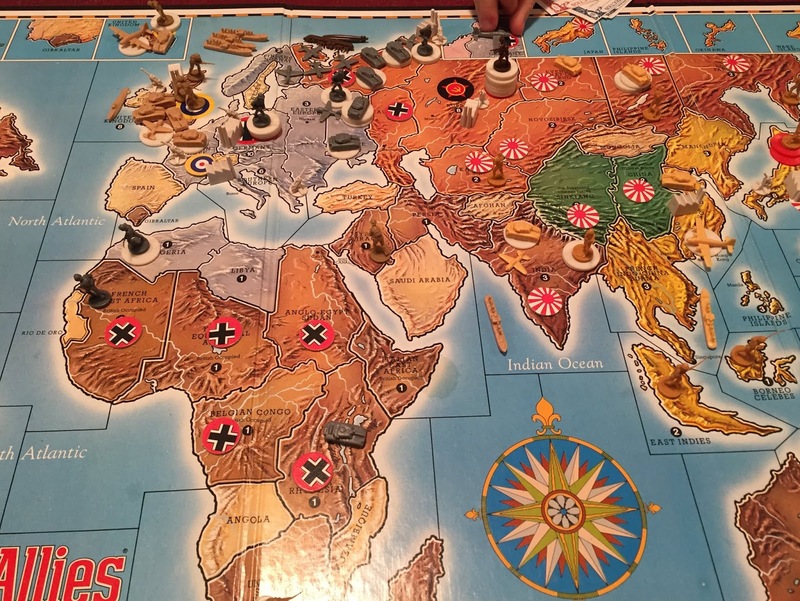 The game is similar to Risk in many ways in that it is based on a global map broken into chunks, battles are fought by moving playing pieces from one map section to another and rolling dice. The "economic" system is a bit more complex -- IPC's (Industrial Production Points) are earned for each map space occupied, although each space is worth varying numbers of IPCs. You can also only build new units on map spaces where you have an industrial complex. A big plus for this game is the very nicely sculpted miniatures which beat the pants off of any abstract tokens. Each nation's infantry is unique to that country (i.e. the German infantry look like Wehrmacht troops). In later editions the aircraft, tank, and naval counters are unique as well athough in the edition we have (2nd) they are all the same just different colours. The game takes about 2-3 hours to play depending on how many players and how quick they are. The reason we give it 4 instead of the full 5 is that since it is history-based and the map starts the same every game this limits replay value slightly (versus games with random setup) and if played too often could get repetitive. In the game manual, the designers note that some players complain that the odds are too heavily stacked in the Allies favour, but Albert and James were able to defeat me using very aggressive tactics (and some of James' trademark "hot dice"). The game is true enough to history for a good game that feels like WWII without getting bogged-down in details. 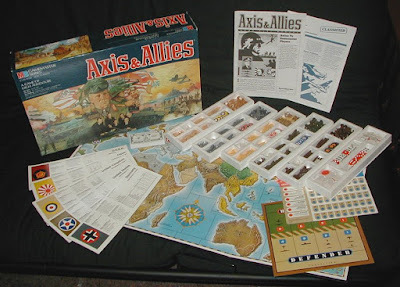 There are more advanced versions of Axis and Allies which we look forward to acquiring, but the "basic" or "classic" version is probably the best for more "casual" board gamers or people who don't feel like investing 6+ hours. Setup does take a while, so we recommend that if you're getting together with friends to play, set the board up ahead to save a lot of time. Albert: "I like that teamwork is involved in the game." The game does involve two teams (that cannot be changed) and players, Allies and Axis alike, must work together to have any hope of success. James: "I like how you can build different types of units." What makes this game really stand out as superior to Risk is the fact that there are units with different attack/defence and movement characteristics. In the classic game the options are infantry, armour, fighters, bombers, battleships, submarines, and transports.